Action Tips, Crocodoyle's Action Tips. Action Tips: Want to know how to market on the Internet? Then, get Crocodoyle Dundee's A tips sent right to your INbox. They're fast, furious... funny [and sometimes edible]. In fact they're [almost] the most fun you can have lying down. I promise to use it only to send you Crocodoyle's Internet Marketing Action Tips. Get With The Croc & Promote Your Own Site !! 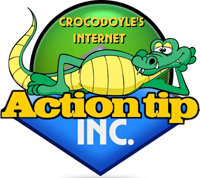 Once you've subscribed to the 'Crocodoyle's Internet Marketing A Tips' you can contribute to the action tips [and promote your own web site too]. Cut And Paste the following code onto your web site pages. Then: Send us your Action Tip [the email link is in the tips]... and we'll include it in one of the Croc's after lunch editions. You'll get the contributor's web site link with your tip. "All will become clear when you get the Croc's tips." [Note: Please don't email the croc asking... "How do I do this"?